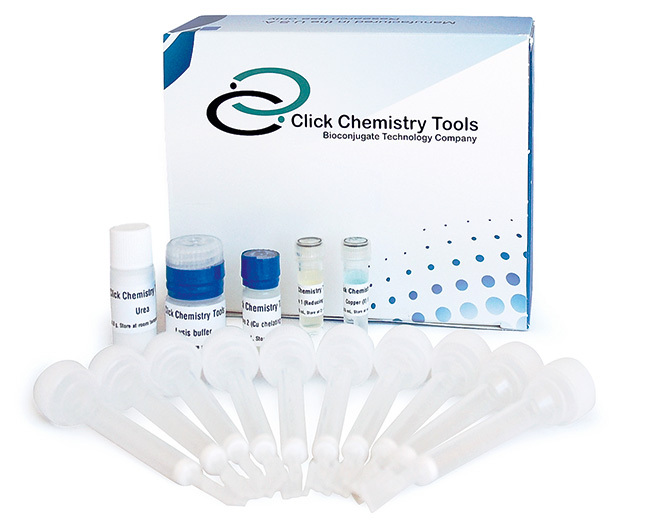 Click-&-Go™ Protein Enrichment Kit is an efficient tool for capture of azide-modified proteins on an alkyne-agarose resin. The azido-modified proteins, or their post-translationally modified forms, are captured from complex protein extracts on the alkyne-agarose resin supplied. Once covalently attached to the resin via copper catalyzed click chemistry, beads can be washed with highest stringency virtually eliminating any non-specifically bound proteins to yield a highly enriched population of nascent molecules. Upon protease digestion, this yields a highly pure peptide pool that is ideal for mass spectrometry (e.g., LC MS/MS) based analysis. Click-&-Go™ Protein Enrichment Kit is an efficient tool for capture of azido-modified proteins on an alkyne-agarose resin. The azide modification can occur via metabolic feeding, enzymatic addition, or chemical modification. The azido-modified proteins, or their post-translationally modified forms, are captured from complex protein extracts on the alkyne-agarose resin supplied. Once covalently attached to the resin via copper catalyzed click chemistry, beads can be washed with highest stringency virtually eliminating any non-specifically bound proteins to yield a highly enriched population of nascent molecules. Upon protease digestion, this yields a highly pure peptide pool that is ideal for mass spectrometry (e.g., LC MS/MS) based analysis. Click-iT® is a registered trademark of Thermo Fisher Scientific.